Tesla has built the world’s biggest lithium-ion battery in the state of South Australia, making good on Elon Musk’s promise that it would complete the build in 100 days or wipe off the $50m cost. The 100MW lithium-ion battery in South Australia will provide much-needed back-up power to the state. Announced this week in a blog post by South Australia Premier Jay Weatherill, the battery – which is located near Jamestown and will store renewable energy to provide much-needed backup power to the state – was first announced as part of the State Government’s Energy Plan revealed in March 2017 with the contract awarded to French renewable energy company Neoen and Tesla in July 2017. Tesla CEO Elon Musk had tweeted that the battery build would be completed “100 days from contract signature or it’s free”. 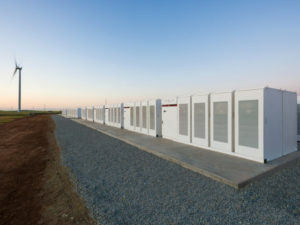 The 100MW battery uses Tesla Powerpacks, connected to Neoen’s Hornsdale windfarm, and will be tested in the coming days to ensure it meets AEMO and South Australian Government requirements before operations begin on 1 December. Jay Weatherill said: “The world’s largest lithium-ion battery will be an important part of our energy mix, and it sends the clearest message that South Australia will be a leader renewable energy with battery storage.